A custom closet is a luxury within your reach when you choose us. Our custom carpentry expertise has delighted many customers. Whether you want a personalized closet design or a full remodel to add a closet, we’ll give you the closet that meets your needs. Even spacious closets can become cluttered messes because they lack organizational features. Added accessories just take up more space. If you have to climb over bags of bedding to get into your closet, it’s time for professional closet design. A custom closet gives you sturdy, built-in storage that meets your needs. Messy closets are annoying and can be dangerous. Climbing on stools or stepladders to reach cluttered shelves can lead to a fall. Shelves and rods bearing too much weight may collapse, making a shambles out of your closet and ruining breakable items. We’ll work with you to remodel your closet so that you can see everything at a glance. Your custom closet can include a floor-to-ceiling shoe rack and rods set at different heights for suit jackets or dresses. Popular features for a custom closet are drawers for lingerie, shelves that accommodate the largest comforters and cabinets for your valuables. When you choose custom closet design for your existing closet, you do more than make the most of the space you have. You also eliminate mess that can spill over into your bedroom and cause you stress. Closet design is also great for children’s rooms. Low-set rods, shelves and drawers make it easy for kids to keep their own rooms neat. Some homes don’t have enough closets. 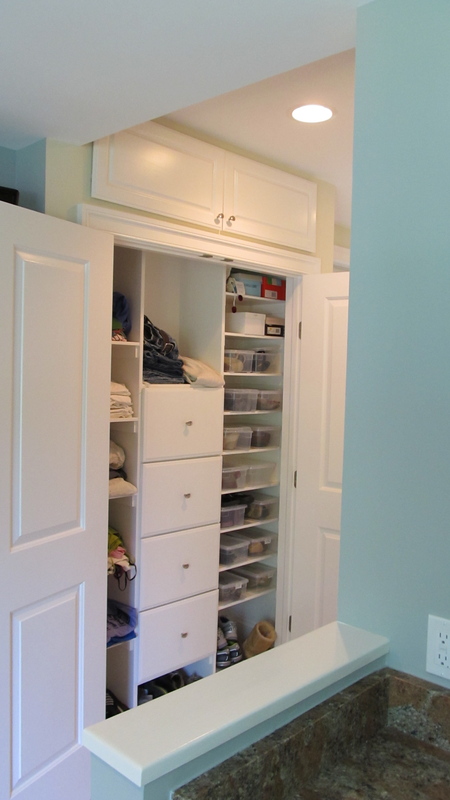 Adding a custom closet solves storage problems and adds value to your home. When you remodel, you can design the walk-in closet you’ve always wanted with features like benches and free-standing cabinets. We have custom carpentry remodel experience with old and new homes and can create a new closet that fits your home’s style. Cedar wood is beautiful and well-known for repelling insects that eat clothing, paper and other things you may store in your closet. Cedar closets can be casual, rustic or elegant. There are no limits to the design of your cedar closet but your imagination. Look over these closets for some starter ideas. Call or email us for your custom carpentry remodel needs, and we’ll give you the beautiful closet you’ve always imagined.